Today, we will see how we can use Bloom Locked Content. Locked content is the great way to get the new subscriber. We have to subscribe first then only we can see the free resource. Click on Bloom -> then click on Optin forms. We need to connect your bloom to email marketing service such as MailChimp. You will see the button “Generate shortcode” and when you click on that button a new shortcode will appear. In this, we just have to replace the “content” with our own content that we want to hide. Sometimes users try to use another shortcode such as custom button inside the Bloom locked optin but it doesn’t work. 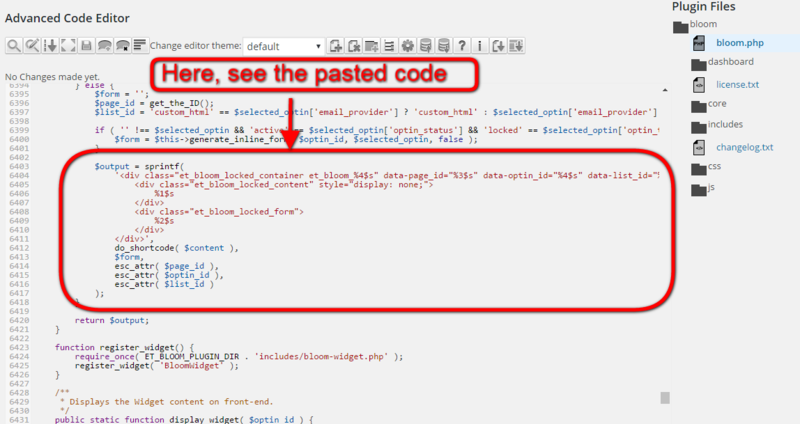 For this, we have a method to use the shortcode as a hidden content. I am taking a custom button’s shortcode for example. Now when you use such code, it won’t work. Replace the above code with the code give below. After this, you will need to subscribe first if you want to access that button. Hope this article helped you, if this post is helpful, please subscribe us and let us know if there is any other issue related to the post, we will be happy to hear from you. Is there a way to change this in the functions.php file, without editing the bloom.php file? Hi there – this tutorial is great! Thank you! I’m looking to add a shortcode to a Flipbook within the Bloom locked content shortcode … I can pretty much get it working, however I have to refresh the page for the Locked Content (ie the Flipbook) to appear. Would you have any tips on how to have the Flipbook appear *without* having to refresh the page? and I do miss an image on how the results looks like. I was hoping to find an instruction on how I could lock a page content, unless the visitor subscribes to the newsletter. If the person subscribes to your Newsletter to see the content, will the plugin recognize him and show him the free content as long as he is in the email list or how can I understand it? hello, thanks for your tutorial but I have a question after a user insert e-mail one time any other time that he came back on the website he’ll have free access at content, without insert own e-mail again, and this is a problem to give new locked content in the same page. Do you know how fix this problem? Dear, I’m looking to hide a whole page with these shortcodes from bloom but it doesn’t work. I have divi builder. could u help out?